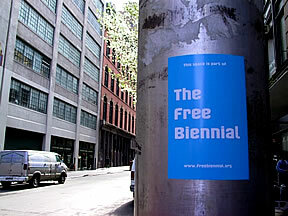 The Free Biennial has no official space or venue except the public space of New York. Events and projects are taking place all over the city, in parks, on sidewalks, in apartments, studios and galleries, as well as through the broadcast airwaves, telephone and mail systems and on the internet. ARTISTS please see the open call to artists to enter FREE MANIFESTA, which will be held in Frankfurt, Germany from May 24 - August 25, 2002. READ SHERRY WONG'S ARTNET ARTICLE "BONUS BIENNIALS"